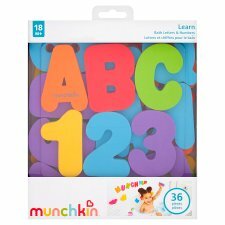 Little ones can enjoy endless hours of bath time learning fun with this set of 36 floating letters and numbers from Munchkin. Made of soft, durable, non-toxic foam, the letters and numbers cling to bathroom walls when wet and can help your child identify the alphabet, learn to count, spell simple words and understand different colours. WARNING! Not for use for children under 24 months. Choking hazard. To prevent drowning, always keep child within arm's reach. Always check temperature of water before placing child in bath. This product should not be used as a teether. Toy to be used under adult supervision. Discard all packaging components before use. To clean, wipe with damp cloth and allow to air-dry. *Mon-Fri, 10am - 4pm, UK only. Calls cost 10 pence per minute from a BT Landline. Calls from other networks and mobiles may cost more.